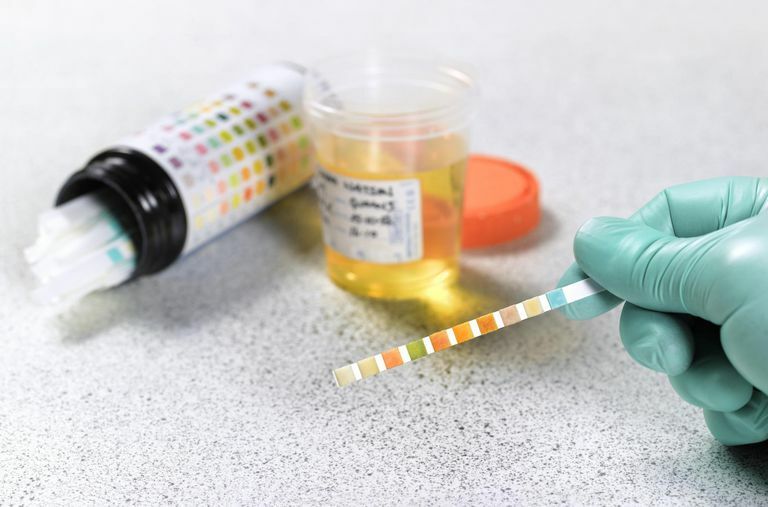 The ethyl glucuronide (EtG) test is widely used to detect the presence in the urine of ethyl glucuronide, a breakdown product of ethanol, the intoxicating agent in alcohol. It can also screen for EtG in your blood, hair, and nails, but the urine test is the most widely used. The main purpose of an EtG test is to document​ the required alcohol abstinence. It's important to note that the EtG test is not recommended for use in workplace testing programs as it does not measure current impairment from alcohol. You may be surprised to learn that after consuming alcohol only about 0.5 percent to 1.5 percent of it is eliminated in your urine. That's after it undergoes a process called glucuronidation to form the breakdown product EtG. The EtG test is quite sensitive and can detect even low levels of alcohol. In fact, the test can detect alcohol in the urine up to five days after consumption. In studies of participants without alcohol-use disorders, EtG has been detected in urine samples for up to 80 hours (3.3 days) after heavy alcohol exposure. The reality is that there are hundreds of household products that contain ethanol, according to the National Library of Health's Household Products Database, and exposure to them could possibly lead to a false positive on the EtG test. SAMHSA lists EtG as a test that can help both rule in or rule out whether someone has been drinking with high accuracy. For instance, as what's called a "sensitive" test, the EtG test accurately detects a person who recently consumed alcohol 70 percent or more of the time. One study showed that for moderate to heavy drinking, this number jumps to 85 percent. As a "specific" test, the EtG test identifies people who did not recently consume alcohol 70 percent or more of the time—and up to 89 percent of the time if they weren't drinking moderately to heavily. All in all, the EtG test is considered a highly useful test for detecting recent alcohol consumption. But like any test, there is the possibility for a false positive. This is why a positive test should be confirmed either with another test or with verification from the person that he or she did indeed drink alcohol. Hopefully, as the research on EtG and other alcohol biomarkers unfold, a clearer cutoff value can be made in order to distinguish between true alcohol use and exposure to alcohol in environmental products. Jastrzębska I, Zwolak A, Szczyrek M, Wawryniuk A, Skrzydło-Radomańska B, Daniluk J. Biomarkers of alcohol misuse: recent advances and future prospects. Przegla̜d Gastroenterologiczny. 2016;11(2):78-89. Jatlow P, O’Malley SS. Clinical (nonforensic) application of ethyl glucuronide measurement: Are we ready? Alcoholism, Clinical and Experimental Research. 2010;34(6):968-975. Shukla L, Sharma P, Ganesha S, et al. Value of Ethyl Glucuronide and Ethyl Sulfate in Serum as Biomarkers of Alcohol Consumption. Indian Journal of Psychological Medicine. 2017;39(4):481-487. Substance Abuse and Mental Health Services Administration (SAMHSA). The Role of Biomarkers in the Treatment of Alcohol Use Disorders, 2012 Revision. Spring 2012;11(2).